Just riding across the country with kids is challenging. Taking the leap and moving can be even more daunting. That doesn’t mean you have to feel like the Beverly Hillbillies when you move cross-country. With some preparation, and a spirit of adventure, you can make moving across the country not just less painful, but even a little fun. You might be really excited for this move. Maybe you or your partner got a new job or a job promotion. Or maybe the opportunity to go to a dream location has turned up. Whatever the reason for your move, you may discover that your children are far from excited. Your “great news” may be met with wailing, whining, or tantrums—no matter at what age your children are. “But what about my friends,” you might hear. “But what about my school,” the wailing may begin. Teams, activities, friends, and family could all be reasons why even the idea of moving strikes fear into your children’s hearts. It is important that no matter what the response, whether excitement, fear, anger, or sadness, that you listen to each child’s concerns. Remind them that friends and family can be kept in touch with through email, Facebook, Skype, and the good old telephone. Try and get them excited about the possibility of new friends and activities that can be found in almost any town. Explain, in detail, what will happen and when. If your children are very young, let them ask questions and answer them simply. Try not to overcomplicate the issue with excessive details. This can make things worse, especially with young kids. Packing up items can be a frightening experience for some children. If you have never moved before, a child may not understand that they will see their items again. While this is a good time to get rid of unused items, try not to get rid of too much if you can avoid it. Talk with local moving companies about options for packing and storing your items. Any help you can get in packing the house will give you more time to help your children adjust. Having to pack up items, leave their old home, and donate your old stuffed animals to a thrift store might be more than some kids can take. Recognize the stress level your child is reaching and pack accordingly. Let your children help you pack. Show them how to pack a box and then let them label the box if they can, or draw a picture on the box so that they know which ones belong to them. Also, keep favorite items out and put them in a backpack or basket for the ride to your new home. A doll, stuffed animal, or a few favorite cars or Legos in a bag can make the kids feel much better during the ride. Once the bags and boxes are packed, and you’re in the car, it’s not much different than any other road trip. Allowing a cross country moving company to take your items to your new home can leave you free to enjoy your trip. Keep tablets charged for little ones (and big ones) to play games and watch movies. Pack a cooler full of fun and familiar snacks. A long road trip is not the time to quibble about nutrition! If you can make the road trip more fun by letting your littles have their cheese crackers for breakfast, go for it. It’s all part of the adventure. As with anything with kids, the key to your sanity is in your flexibility. You may have a strict timetable for getting there in your head, but try and remember that part of the joy is in the journey—not just the destination. Stop at interesting roadside landmarks, learn a little history, play at new playgrounds, or eat at roadside stands. Making the journey more of a vacation and less about “getting there,” can make the whole move more fun and put your kids in a more adventurous mood regarding the new place. 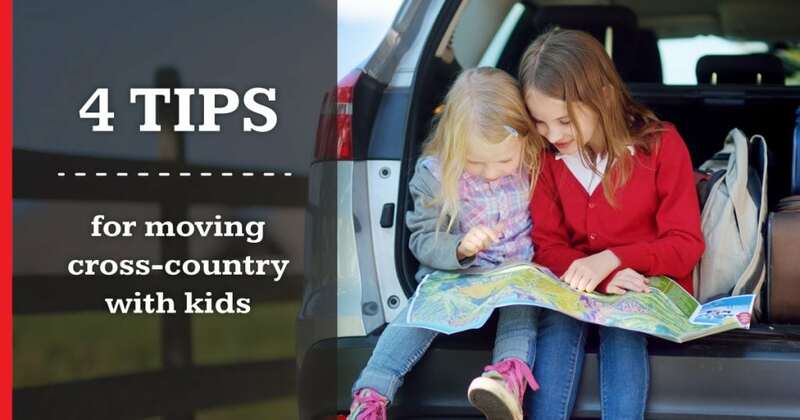 With a little planning and consideration, you might find that your cross-country move, even with kids, is not nearly as stressful as you thought it would be. When you’re ready for your next adventure, call the local moving service at Marrins’ Mooving and ask about getting your free quote.